I wanted to blog something Valentine’s today but mid Missouri has had so much snow that we have not dug out yet. So here is a little blog that I didn’t post a while back when I first made these notebooks! I hope you enjoy! 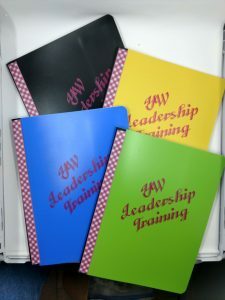 I made these notebooks have a little more personality for our girls going through leadership training. They were just a inexpensive notebooks and then I put some decorative tape on the spine and cut some vinyl for the front! The girls liked them!!! If you would like receive an email when I post a new blog, please leave your email in the comments and we will add you to our list! With our daughter, Jessica getting married we needed to come up with some thank you gifts for each table. Jessica loves bubbles. Here are some cute bubbles we found. 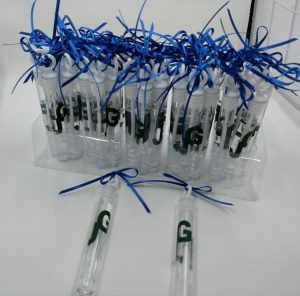 Add some green initials J and G to the bubble bottles. Jessica’s color is dark green. They were cut on the Cricut machine. And some blue ribbon to the wand. Gene’s color is Electric Blue. Wow! It has really been a year since I have been on this blog and I apologize to all of you! We have had some excitement in our lives! Steve lost his job in Utah and we lost 2 very close people to us. Then Steve got a job in Missouri!! He has been here since October 2015. I stayed in Utah and sold our home and have now joined him here in Missouri! I think I am settled enough to get back to this blog consistently, at least that’s my goal!!! So here is a quick and easy way to make flowers using your cutting system and your corner rounder!! Cut 3 different size circles with your cutting system, I like to use different papers. Also it is a little easier with something thinner than heavy cardstock but I did use cardstock on some of mine. Fold your circle in half and round the ends off with the corner rounder. Notice how far the circle goes into the rounder because this affects the shape of you petals. Now unfold the circle and fold it in the opposite direction and punch again. Do this 2 more times folding to what you might call the diagonals. Repeat this for all 3 circles. Now layer the circles together from largest to smallest and you have a cute flower that matches any project!! !